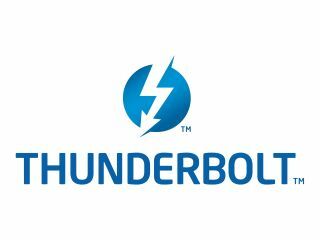 Intel's Thunderbolt I/O technology will hit the PC market in April 2012. The super-fast next generation data transmission tech is currently only found in certain models of Apple's iMac and MacBook lines. But according to Digitimes, Intel is ready to start spreading some in-out lovin' in time for the release of its new 22nm Ivy Bridge processors, due in April. Intel has plenty of motivation to start the roll-out of Thunderbolt into the PC market. It has fierce competition in the data-transmission wars in the form of USB 3.0, another next-gen I/O tech which Intel itself is supporting in Ivy Bridge. So to avoid USB 3.0 being given an even bigger head start, it certainly makes sense to pack Thunderbolt up with its lunchbox and PE kit and send it off to PC school without delay. Both I/O technologies offer transfer speeds far in excess of what USB 2.0 is capable of (USB 3.0 is ten times faster, Thunerbolt is twice as fast again) but the beauty of Thunderbolt is that any one machine would only need one port. Every Thunderbolt device has an in and an out port, which means instead of having five peripherals plugged into the back of your PC, they'd be daisychained together with only one physically attached to your machine. Back in September, Asus and Acer announced they'd be launching Thunderbolt-compatible PC products in 2012, so expect these two to be among the front runners in April when products start appearing.